In The Education of a Value Investor Guy Spier discusses the subject of checklists, and how to develop and use them in investing. This is the main subject of chapter 11―An Investor’s Checklist: Survival Strategies from a Surgeon. 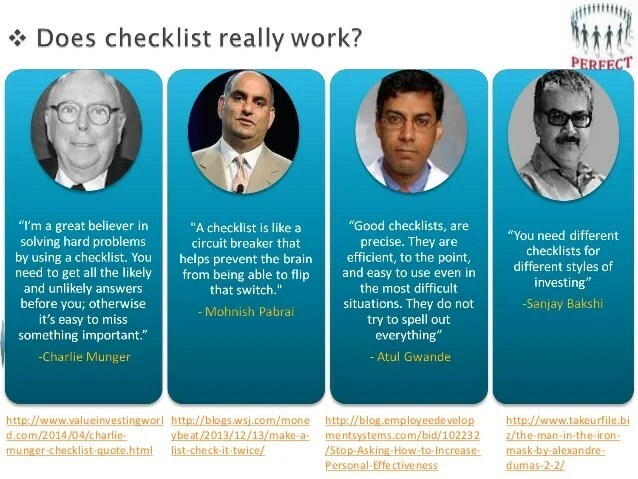 Spier shares some of his own insights and his view of checklists as a tool to prevent investors from making mistakes. What’s the Use in Using an Investment Checklist? Let’s consider a few points before moving on, to get a quick refresher on the subject of investment checklists, and why a checklist could serve you as an investor good in your investing process. All quotes below are taken from Guy Spier’s book as referred to above. Who? An investment checklist for you yourself as an investor. What? An investment checklist containing broader categories (“including themes such as leverage and corporate management”) made up of individual checklist items (such as “has this management team previously done anything self-serving that appears dumb?”). When? As a tool to be used before we make a final decision to buy or not buy into a certain business. Where? As an integral part of your ongoing investment process, and as a tool in your business analysis and investing. To keep it simple. Each checklist item you chose to put up on your checklist, you include for one reason, and one reason only. That is, to avoid the cocaine brain mental state, and to make your best effort in trying to make sure not to break the two rules mentioned above by Buffett. As any checklist, an investment checklist is often made up of individual checklist items, that together constitute broader categories, that in turn form the checklist as a whole. Let’s look at an example to see what these broader categories may look like, by looking at a well-known quote from Warren Buffett taken from his 1977 letter to shareholders, where he lays out four things that he looks for in a business (emphasis added). The quote above contains four points (or broader categories): 1) an understandable business, 2) favorable long-term prospect, 3) honest and competent people, and 4) an attractive price. For each one of these points one needs to determine what factors (individual checklist items) to consider to be able to reach a conclusion. Another quote from Buffett could give some advice on what to look for when evaluating management (emphasis added). And how could you find the information you need to make a judgement call like this? Again, let’s turn to Buffett for some advice (emphasis added). In the book Spier gives a few examples of different kinds of checklist items in connection to different case studies that he goes though to show the reader the reasoning behind how he derived the items in question. To put each checklist item below in the proper context, I urge everyone to check out Spier’s book and to read each of the case studies. In this post I will just briefly quote the questions as examples of what a checklist item could look like. The first case study called “The Man Who Lost His Cool” is about the author’s investments in different for-profit education companies. Here the reader gets two checklist items that seem to belong in the corporate management category. In case study number three “What Lies Beneath?” Spier goes on to discuss his investment in CarMax―“the Wal-Mart or Cotsco of secondhand cars.” CarMax business is heavily dependent on the company being able to provide its customers with financing, since without financing customers won’t be able to buy a car. In other words, debt markets was (and is) of utmost importance for CarMax’s business model. So, what happened? The financial crisis happened, and customers were not able to obtain the credit needed to buy a car, and as a result sales dropped and the stock price dropped too. The fourth, and the last, case study is “How I Lost My Balance.” This case study is about a food company called Smart Balance (since renamed Boulder Brands), and about the author’s “narcissistic hubris” that led him to pay too high a price for the business. Disclosure: I wrote this article myself, and it expresses my own opinions. I am not receiving compensation for it. I have no business relationship with any company or individual mentioned in this article. I have no positions in any stocks mentioned. Thanks for those kind words. Glad you like it! You know what they say about a man without a checklist don’t you? He never flew anywhere, but he knew a man who did.